It's cheap, which helps, but unless you can accurately predict your opponent's hand or already know what's in it, you're not going to be getting very much mileage out of this. If it wasn't an attachment it would probably be a solid meta card. Still not that great, but if your Miskatonic deck has problems against Mi-Go or something, it would be an option. I disagree with the above. Cultist rush doesn't like this card. Nor does Government. Or Lodge. In fact, if you look at most colour decks you will see common subtypes that can really cramp the opponent. As a tome Misk get loads of ways to search/recur it. Finally, if you fear events then naming Disaster or Tactic can help a ton. After the first couple of turns you should be able to guess what subtypes your opponent is running. This is a card I've been eagerly waiting for. A cheap non unique tome with a triggered effect, this is the perfect fuel for my tomes and libraries deck. If you combine this with ST you can prevent your opponent from reducing costs and once you bounce a character you know what subtypes to target. 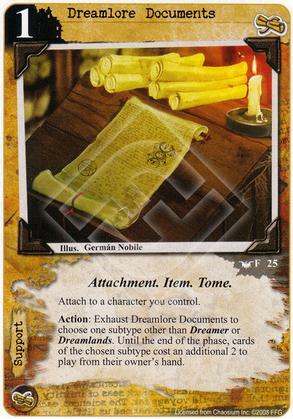 Now that this has been reprinted this will soon make everyone's most hated list. The worst part about this card is the fact your opponent gets to take the first action during the Operations phase. So, chances are, your opponent will get to play the character or support card he wants before you can trigger this.